Housed in a building that's been handsomely rebuilt and restored from the ground up, El Trocadero is truly a gem, having opened for business in late 1998. Covering nearly 3,500 square feet, this expansive and well-appointed eatery features a large, light and bright main dining room, a cozy covered patio out front along a revitalized Main Street (formerly San Fernando Road), a spacious, shaded outdoor eating area to the rear, and a generously sized bar equipped with flat-panel television screens. While the remodeled building that houses El Trocadero stands out from the crowd, it quickly becomes second fiddle to the restaurant's main attraction: A tasty selection of Sonoran cuisine that's light years ahead of traditional south-of-the-border fare. The food, prepared in the style of the owners' native Nogales, Mexico, is noticeably lighter and tastier than menu items offered by typical Mexican restaurants. A focal point of the kitchen is the mesquite grill, from which a tantalizing selection of steaks, poultry and fish entrees are prepared. Prices, too, are also noticeably lower than other restaurants of El Trocadero's caliber. The place is the brainchild of Raul Bojorquez and his wife Dora, who head up this family enterprise. The restaurant is the family's second El Trocadero and first venture in the U.S. Other members of the family continue to operate the original El Trocadero in Sonora. The downtown Newhall restaurant is a pioneer of sorts, essentially the first major business to open in conjunction with the area's redevelopment. 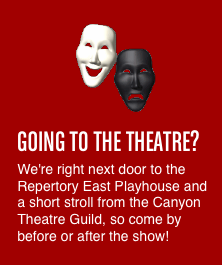 Right next door is the Repertory East Playhouse (or The REP), and just a short stroll down the street is the Canyon Theatre, home of the Canyon Theatre Guild. And, out the back and across Railroad Avenue is the City of Santa Clarita's Jan Heidt Metrolink Station. Raul Bojorquez first arrived in the Santa Clarita Valley in 1997, having heard about the City of Santa Clarita's plans to revitalize the historic downtown district. The idea of redeveloping Old Town Newhall struck a chord with him, and soon plans were under way to open the first El Trocadero on non-Mexican soil. Bojorquez said he believes in the vision of a future Old Town Newhall becoming the SCV's version of Old Town Pasadena. The Bojorquez family invites you to taste Mexican food the way it was meant to be savored. You can visit them at 24274 Main Street (at Market Street) in Old Town Newhall. They can be reached at (661) 284-6615. If you haven't been to Old Town Newhall lately, you'll be pleasantly surprised at the progress of revitalization efforts. One of the first and more noteworthy improvements is a family-owned restaurant by the name of El Trocadero Mesquite Steakhouse.